Rain's Garden: Scribble Picnic: Black and White and Poutine Night! Scribble Picnic: Black and White and Poutine Night! This week's theme for Michael's "Scibble Picnic" (follow the link for more wonderful art! ), is Black and White. I'm fascinated with fairy tales - not the "happily ever after Disney" kind though - the real cautionary tales for children that were written in the 1600's and didn't usually end well! This is my Red Riding Hood. I did a big acrylic on canvas years ago with this theme but I wanted to recreate it with watercolour. I did use watercolour paint, but no water lol...so it's more of an acrylic style! It's hard to see, but I did add a wee bit of red to Red's hood and cape! This was really fun to do! I got some curd cheese made this week so that we could have a poutine night. 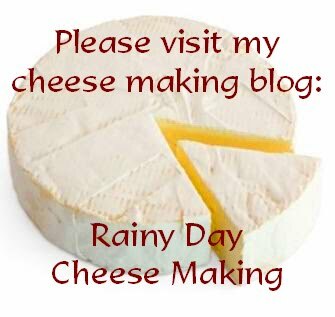 Still not squeaky though (more details on Rainy Day Cheese Making)...I have another recipe to try next time! I made this poutine with breaded chicken bites and we made a homemade red wine gravy. It was really good! But we still have to perfect our poutine gravy! More tests will be needed, oh too bad huh? :) My cheese making has slowed down a bit as I wait for my new bacteria order. I'm waiting a little impatiently! It may only arrive in another week. One of the cultures I ordered is Penicillium Candidum. I find all of this bacteria stuff really interesting, that one is for the Camembert so that it'll form it's white coat! We are in a mini heat wave this week, so nice! The highs are in the 30's (high 80's) but the nights are cool enough to sleep well. The leaves are starting to turn too, it's a wonderful time of year! This is the river near our house. I pass this every day when I walk the dogs. I mentioned that a lot of my tomatoes have been falling off the vine before ripening. I read a trick that you just put them in a window and they'll eventually turn red, well, they did! I picked some lettuce too so tonight will be some kind of salad. We also have a nice yellow lemon! I LOVE my garden! I'm just so sad it's nearly done for the season! Doesn't it seem that we wait FOREVER to get tomatoes on the vine and then - bam! The season is over! I am still hoping to plant something in my cold frame before winter sets in. Such a pretty place you live in. I am definitely a member of the Turophile Club! Your Black and White picture is fantastic!! Really great! 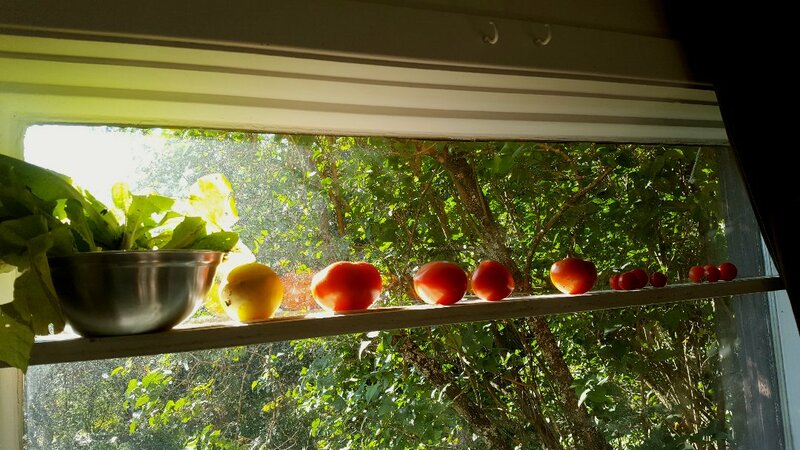 I do that with my tomatoes that fall off too early, just put them in the sun. Same for bananas that are not ripening fast enough. Into the sun for everyone! :) Except me. I am most definitely a turophile! I am going out to pick some tomatoes and peppers and make a pot of chili, if I had some of your nice cheese I would put it on top when I serve it. So lovely to have a river near by. Running water is a delight. Your fairy tale scene feels autumny and also Halloweeny, I like looking at it. So did you use the fresh tube paint strait on the brush? So interesting. I have done that a few times when it is with mixed media, that is the only way it will stick to other things. Hi Dianna :)) Every time I brag about my heat waves, I think of you melting in the humidity lol...soon my friend...it'll all be over!! :) That river is so gorgeous, and we used to bring the dogs in there, except now the rassa-frassin' town hall has put a little deck on the only spot where we can safely let them go in and it's full of tourists all the time bah. There is no sanctuary in this village anymore. Just two short years ago, it felt like we had the place to ourselves. I'm glad you saw the sinister in my adaptation! :) I have that Tim-Burtonish creepy side to me :) Red is in deep trouble, let me tell you lol! Another fellow turophile...we may need to start a support group lol! Hi Gill :) Oh...the idea of chili with all that homemade cheese is really making me hungry! I have some slow cooker chili on the menu plan, but I'm waiting until the heat wave is over!! your black and white art piece is wonderful! great trick with the tomatoes, saved the day! your cheese curds look tasty. Little Red Riding Hood in black and white is so scary.....and that wolf....Oh dear I can here him saying....Come closer dear...let me see your pretty little face...yum, yum. The use of watercolor without water is so interesting. great effect. Your take on the Scribble Picnic definitely has an eerie, sinister feel...nice work! What a lovely spot to pass by daily while walking your dogs. I've heard that you can pick tomatoes when they start to change colour and then just sit them on a kitchen bench as they will continue to ripen. I've also heard that they should not be stored in the fridge as it can take away a lot of the flavour...they are best kept at room temperature apparently. I've also heard about not storing tomatoes in the fridge, but I am guilty of it! I think it's because we go out shopping only once a month, and I want to keep them fresh as long as possible...but I'm sure the flavour suffers. I was hoping to have fresh tomatoes all of August and September but the weather wasn't cooperating much! Good job on the painting! Glad you were able to enjoy the tomatoes. Yes, sometimes we have to pick them before fully ripe so the bugs don't beat us to them. We usually have tomatoes finishing ripening on the counter all season long. Can't beat a fresh BLT! I got really interested in the Michaels scribble picnic and was thinking of doing the b&w but being that I have been house sitting since Sat. I totally forgotten. I will have to check out the next one coming up. Loving what you did. Great job. Oh I LOVE that image of Little Red Riding Hood and the Big Bad Wolf! And that poutine looks delicious. I mean really yummy. I haven't had one in ages. How perfect for the black and white theme today. I always did love the story of Little Red Riding Hood. Hi Rain! your scribble ink this week is gorgeous and i want it! i'd be willing to pay for it - whatever you would charge! 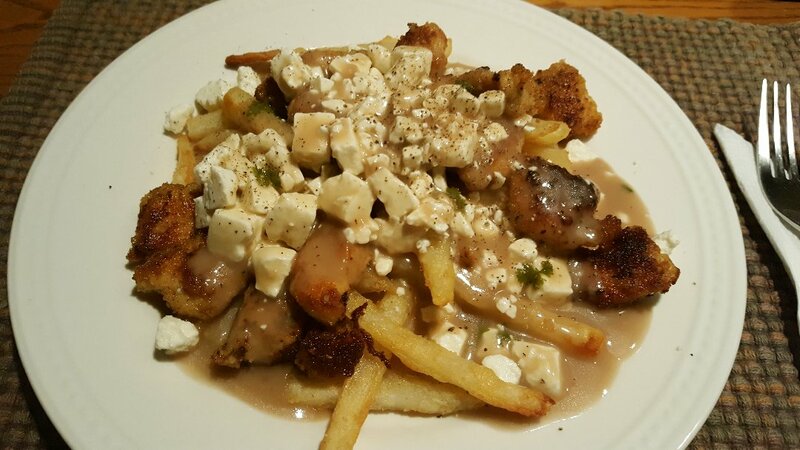 your curds would sure add a nice touch to my poutine - they look lovely! i left you a comment on our blog about potatoes...if you have any other questions just yell through email. your river walk is lovely - we went for a river ride today and i took pics of all 200 islands we have - where we guerrilla garden - teehee. and yes - you can even ripen green tomatoes on a windowsill! You are such an artist! You should make them into cards and sell them. I love your Halloween one and the one of red is really good too! I have to make that poutine....you;re making me so hungry. What great places to walk...my girls can't handle it anymore....we used to walk every day but their joints just can't take it anymore and I don't want to walk without them. Look at your 'maters'! I've also heard you can wrap them in newspaper...just in case you run out of window sill. A most interesting piece. The background is striking with its dark and lights. Excellent. I have about a dozen green tomatoes on my plant. Maybe it's the shorter days or cooler nights that prevents them from ripening. I'l have try putting them on a windowsill if they fall off the plant. 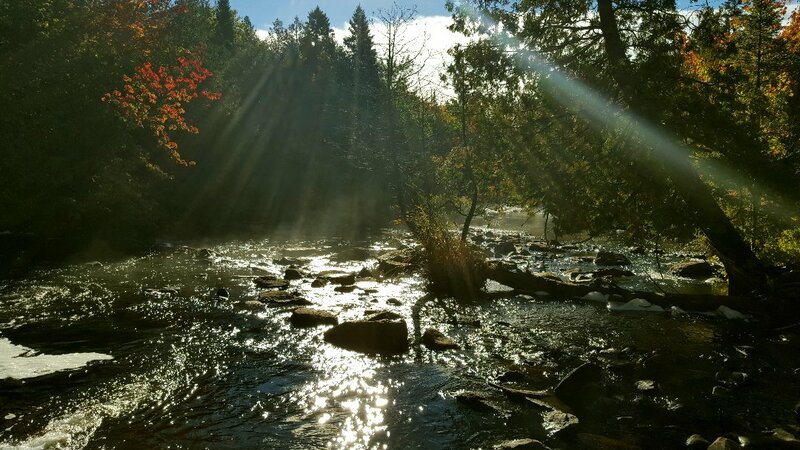 Great and wonderful looking photo of the stream, I hope you are well. Warm greetings to you. 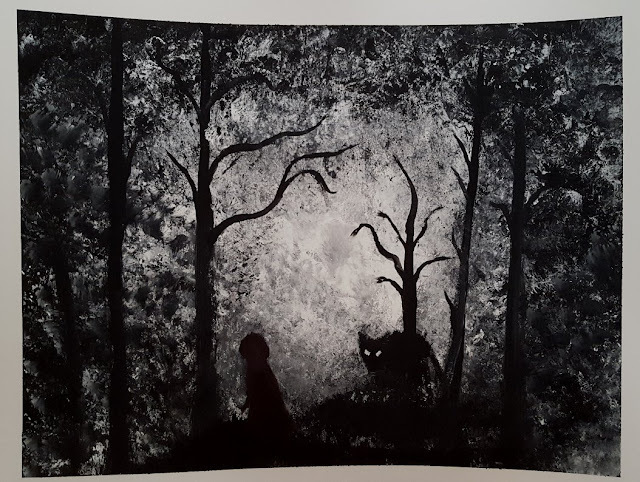 hard to see the details but I like the overall background and the shapes of the trees/red riding hood/the wolf - it's a good night scenery, perfectly reflects the dark theme of the fairytale. My father was an artist and used to let me dabble with his supplies. One day I think I'll take some lessons and dabble myself. In the meantime I'll just enjoy work of others like yours! Well done. And I've never had poutine but that's only because I have no idea where they'd have it here nor how to go about making it since cheese curds would be a difficult here in Texas, ha. That black and white image is spectacular! So fitting with Halloween coming up. I'm not sure I've ever heard the term turophile before. You learn something new all the time with blogging friends. I am loving this warm and sunny weather. The days are beautiful. And since the nights are quite cool, it's comfortable for sleeping. Perfect weather, if you ask me! Your black and white piece is both beautiful and spooky. I really like that. I've never heard of poutine but it looks delicious. Would I be a turophile - possibly. Striking indeed. I love it, Rain! It's haunting and captivating, definitely pulls you in. I love that the watercolour does indeed look like acrylic. Nice job! I love that slight touch of red too as you note. It's a really brilliant piece. Thank you so much for adding it to the theme this week. P.S. I also enjoyed seeing the photo of you on the sidebar nd learning a little more there too about your housing/homesteading stuff. Your great art piece today is putting me in Halloween/Autumn mode Rain - so spooky! Yes I'm definitely a turophile - a new word for me! Sounds better than cheese-aholic which I usually say! Penne Gorgonzola - or tonight's supper. I stand in awe always at a great cheese counter. This was Whole Foods because they really do have the best selection in the US, but of course to me the best in the world has to be Harrod's in London. My husband has to literally drag me away from there when we visit! You are so clever to make your own cheeses Rain. Great creepy atmosphere in this painting, probably would have given me nightmares as a kid. But I'd have still looked at it, couldn't resist a good scare. And I LOVE poutine. Whenever I'm in Canada, I order it constantly. Hello Rain, I must be a turophile too. I loved the black and white picture. It is really quite stunning and is far more than I could ever do. Hi Sam :)) My good friend, so happy to see your comments again! :)) I love those fairy tales...but they have to be a wee bit sinister for my imaginative mind lol...the poutine...it's such an addictive treat. You can make it with just Mozza if you can't find curd cheese. Just make sure you have a good gravy that you like a lot. There are poutine restaurants in Montreal with 50+ version of it...some have crazy ingredients! We're traditional...fries, cheese, gravy...sometimes olives, sometimes chicken bites! But it's so fattening! :) I know you have to watch your cholesterol (don't tell the doctor lol)!! I like that tip about the newspaper. I do only have that one window that's sunny...I have no clue how I'm going to start all the seedlings I want to start next spring...I adopted 2 pugs in 1995. By the time they were around 14 years old, they couldn't do big walks anymore either. The huskies will walk until they drop, but Jack slows down a bit, he's 11 now. They're just so wonderful, I want to give them all the fun I can while they can really enjoy it! Hi John :) The window sill trick really works. I think that my tomatoes haven't turned red because there hasn't been enough sun and warmth. The cold nights certainly don't help. But I have higher hopes for next year! Hi Lissa :) I wasn't really going for detail but I was going for a dark theme, so I'm glad you liked that part! Hi Donna :)) I hope you read this reply! 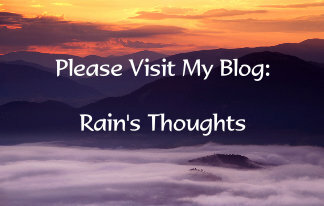 I have been having a heck of a time commenting on your blog! I leave comments, but they don't get published, so I think I might be part of your spam maybe? Anyway, I wanted you to know I DO read and comment on all of your posts!!! Hi 1st Man :)) YES! I did it! :)) I surprise myself at times lol...I'm so happy to read your comment. I love the word ethereal and the meaning behind it so thank you for that. :) Well, I mentioned to Sam above, you can make a poutine without the curd cheese, just with a nice melty Mozza and you'll get a version of it. It's just your favourite fried, with cheese on top, then piping hot gravy to melt the cheese. Make sure you use a gravy that you really like and I'm quite sure I can guarantee a new addiction lol! Hi Martha :)) I think you're right...this is PERFECT weather. It's supposed to stick around until after the weekend, then back to the highs of 18 for fall, which is just fine! :) Are the leaves turning where you live now? I drove to the pet store today and the reds and oranges are really coming out! Love fall in this country! And thank you! I'm really into the spooky kind of art work...I guess it's because of my imagination and my tendency to have nightmares. I like to express them in art, though some are a bit too creepy to publish lol...I get chased by a blind priest with really long fingers, scratching at my back as I run from him, it's at night on a deserted road...he chases me about 10-20 times a year in my dreams...I've had that dream since I was 8 years old. I know what it's supposed to mean, but damned if that blind priest will leave me sleep in peace. Hi Mary, fellow turophile :)) Thank you! I'm glad you felt the spookiness of the painting! :)) Oh my...Gorgonzola and I have a love/hate relationship. I love it, but it doesn't love my stomach lol...I used to make a Gorgonzola and Strawberry Risotto...luscious stuff...but my stomach would revolt...even Blue cheese I have to have in smaller doses! I make up for it with other cheese though lol...your pasta sounds delicious! I have never been to Harrod's in London...I have been to London, but when I was really young (backpacking trip across - at the time - Western Europe! )...I wasn't quite the turophile back then as I am now! :) I think everyone should have a go at cheese making, it's so much fun and you can eat the mistakes too lol! Hi Terry :)) Thank you! I'm glad you like my version of "Red"...her fate is set I'm afraid lol! :) I'm so glad you are a fellow turophile...we are a wonderful bunch of people! :) I have to look back and see which cheese you mentioned on one of your first comments...now that I'm more experienced in all this, maybe I can try it. The river looks so inviting. We had it hot here too last weekend and we it in the lake. Probably the last time for this season tho. Its vold and rainy today. Rain - my favourite cheese is Double Gloucester. Thanks Terry! 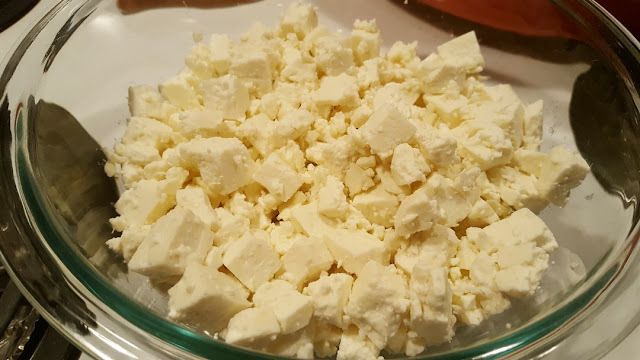 I'm having a hard time finding a recipe for it, but I am finding recipes for Cotswold cheese, which is defined as the same thing, but since I don't know either, I can only guess. Is it the same type of cheese do you know? Hi Alexandra :) Thank you!!! I'm so glad I'm getting a good response for my painting. I do a lot of spooky, dark stuff that I really enjoy, but sometimes others might think it's a bit too creepy lol...Ha! That cheese has my name written all over it! Actually I was wishing at some point I could actually ship some cheese out to people to try, just for fun, but I don't think it would handle the mail delivery too well! Neat addition with the red to her cloak to add to the black and white.